A lot of the UK had snow last week and it looks like this is just the start of our Winter instead of tailing off. The season's are definitely changing here and it's best to be prepared when out and about in case the worst should happen. How many times now have we seen road closures due to bad weather and people are physically stuck in their cars. Or when you're out and about on the road and the cold chilly weather sets in but you're far from home. With this in mind I believe we should all get our cars Winter ready. 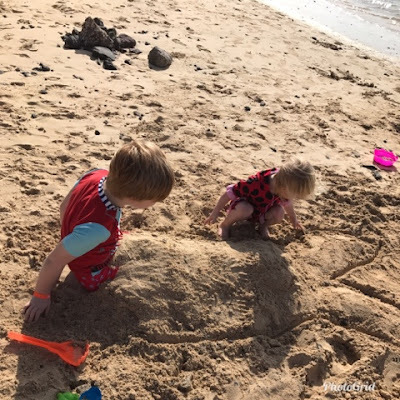 With most of us having children along for the ride it's really the responsible thing to do. 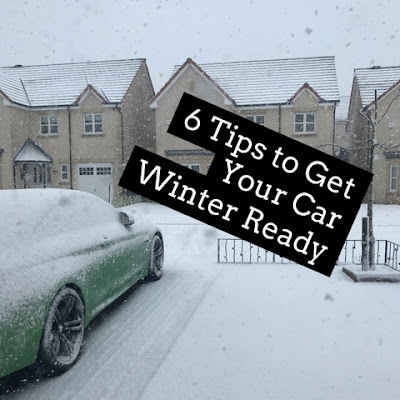 So please read on for my 6 tips on getting your car Winter ready. It's very important that your tyres are up to the job when it comes to Winter. Check your tyre pressure first then check for wear and tare in case you need a fresh set. If there's hardly any tread left then they won't do well in Winter conditions. You might want to consider winter tyres depending on where you live and how bad the weather forecast is. Also a wheel alignment check can be great as if you're not fully aligned this can chew through tyres a lot quicker costing you more. Some garages offer a free Winter safety check where they'll go round the car for you so you don't have to. Of course garages charge for this service as well but it's worth getting done for peace of mind. It might be worth checking is you have a service package with your local garage/ dealership as things like this are included. Find out more from Cars.com. In Winter it's important to have some sort of antifreeze in your washer fluid as subzero temperatures will cause liquid to freeze. You don't want this when you're travelling on the motorway and all the dirt and grime from the road is being splashed onto your windscreen. Make sure and keep the fluid topped up as well, check regularly from week to week so you don't run empty. What if the worst happens and you become stuck!? I always believe it's good to keep a supply of blankets, snacks, a torch, first aid kit, lighter or matches, ice scraper, in car chargers for phone, possibly a shovel for snow in the car just in case. Even in the summer months I always have a blanket, first aid kit and snacks in the car as you never know what could happen. Give your wipers a check and make sure they're fit for purpose. If you've been needing new ones now is the time to get them. Most wipers are quite cheap starting from £5 or less so there's no excuse. Also give them a little clean to take any grime off them or you'll only be spreading that over the windscreen. In winter a lot of the time you'll be driving in the dark so it's really important you can see where you're going and also that other cars/ road users can see you. Have someone on hand to help you check your lights or if you're on your own check them in the dark against a wall so you can see your break lights etc. 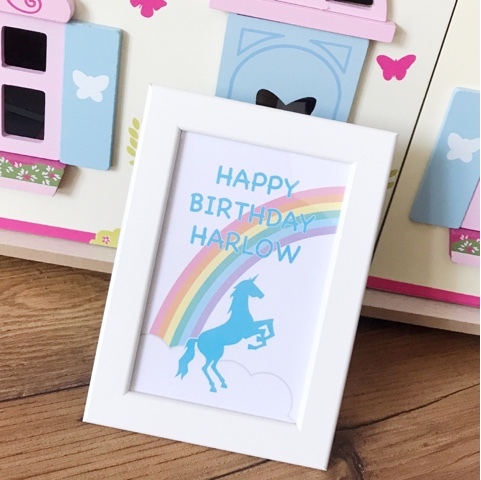 Another year has some how rolled on by and Harlow is now 3! I say it every year with both kids but my don't the days fly by. When I was young it felt like forever before your birthday came round. Now as I'm getting older everything passes in a blur. My baby girl is no longer a baby but a rather confident toddler who will be starting nursery school soon. She just missed out on the cut off which is a shame but April will be here before we know it and that'll be her, away to nursery with the other boys and girls. 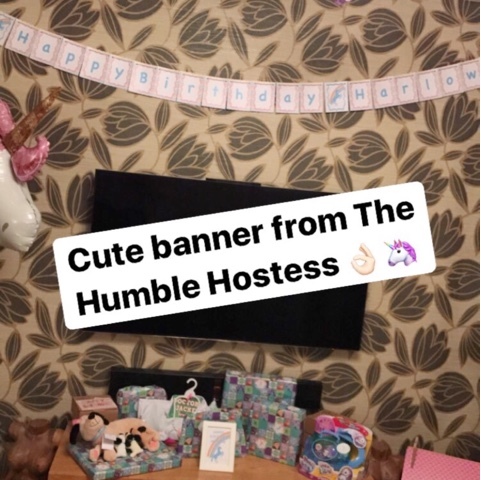 Her birthday fell on a week day again this year so we had family over on Sunday so she could see them and receive some lovely presents. It was a chilled day really. There was a friends party in the morning but apart from that we just chatted to family and Harlow played with her new toys quite happily. On her actual birthday, which was a Tuesday, we got up early so she could open her presents from us. Her favourite was definitely the Pony Cycle she received. It's big but totally cool and even Logan can ride around on it too. 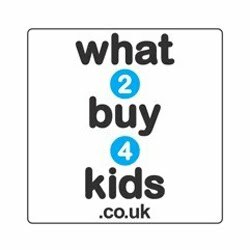 Speaking of presents if you're on the hunt for something lovely and different check out What2Buy4Kids and you can get 10% off with my code as well BREASTNEWS2018. Since Logan had to sadly go to school we dropped him off and then headed through to Five Sisters Zoo to see some animals. Logan's not that fussed about animals so it was fine. 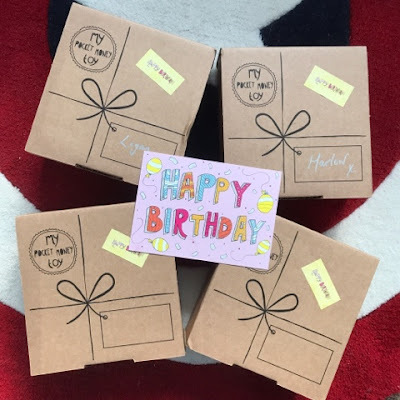 Harlow however loves them so a great birthday treat for her. It was very cold at the zoo but we all really enjoyed it. I think the meerkats and tortoises were Harlow's favs. 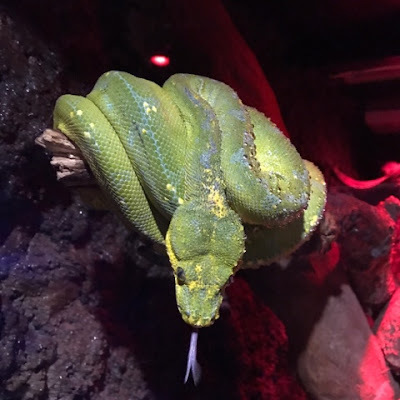 I personally loved the new reptile house they've got. It was of course warm and cosy but full of amazing animals and really big! 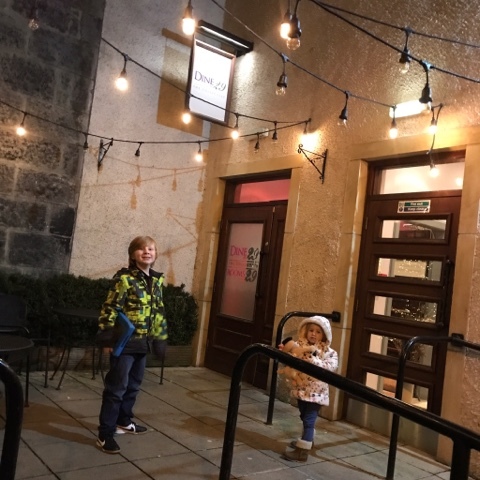 After picking Logan up from school we headed out to Dine at 29 in Dunfermline for a lovely celebratory family meal. 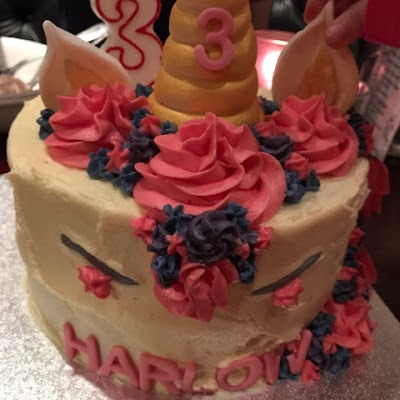 We ate loads, laughed loads and sang happy birthday to Harlow with her awesome unicorn cake. It was homemade by a lovely guy I work beside and it tasted amazing! Thanks Gavin. 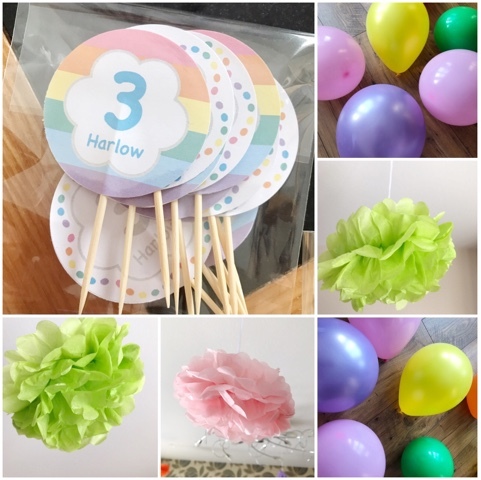 All in all a fabulous wee day celebrating Harlow's birthday and everyone had a good time. 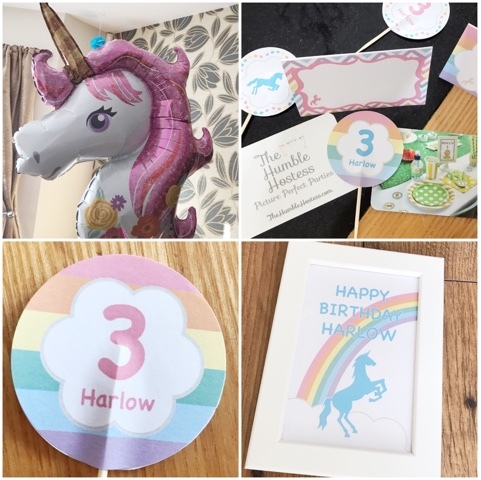 As I mentioned nursery will be the big change for Harlow this year but I'll have to wait and see what else there is in store for my wee babe. We're always looking for fab family friendly restaurants to visit with the kids and were delighted to be invited along to Dine at 29 in Dunfermline to try out their tasty new menu. Dine at 29 is a contemporary restaurant with a Scottish twist and home to Hot Rock steaks. Situated on one floor, Dine at 29 offers a relaxed, friendly atmosphere along with freshly prepared, quality food that everyone can enjoy. Excited to arrive at Dine at 29! 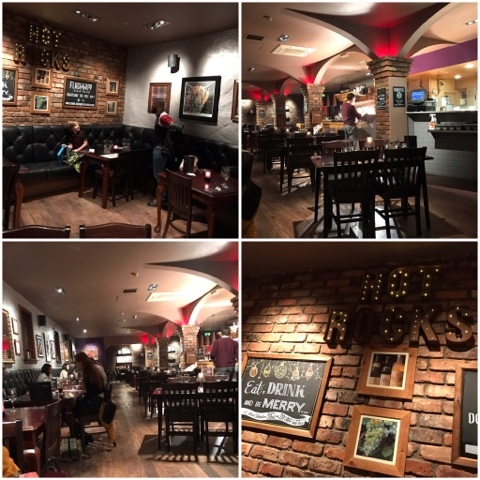 Dine at 29 is located on Bruce Street with a handy car park just a 2 minute walk away. It's open 7 days a week so perfect for all occasions. The kids were really excited to be eating out for a change especially since it was Harlow's 3rd birthday. 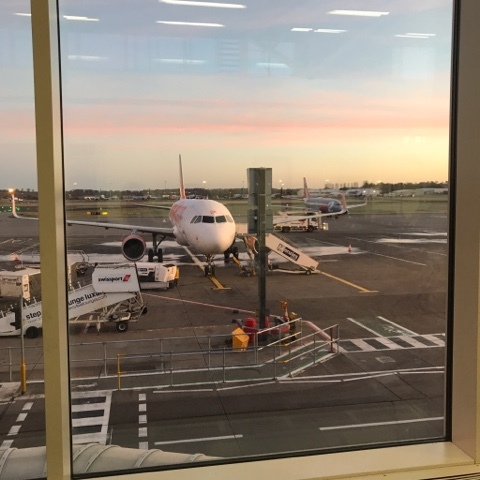 When we arrived we were greeted by very friendly helpful staff who couldn't have been more welcoming if they tried. We were asked what kind of table would suit us best and we went for a corner one so the kids could relax (and I could keep them out of other people's way haha). I also handed a cake over to the staff so we could sing happy birthday to Harlow later. The inside was very relaxed and modern. After getting comfy we ordered some drinks. 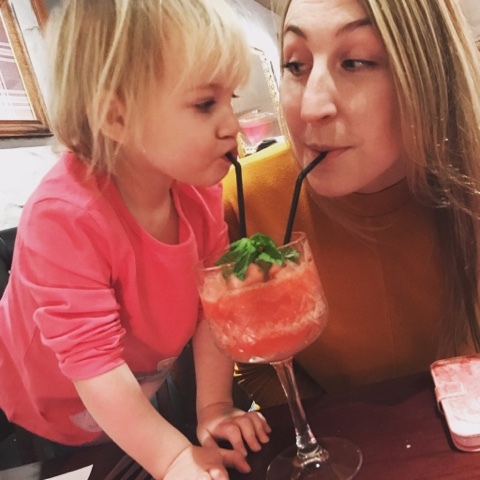 The hubby chose a diet coke, Harlow got herself a fresh orange juice, Logan opted for a strawberry milkshake and I asked for a mocktail (non-alcoholic cocktail) of some sort. I don't really like drinking fizzy juice and get fed up of water so wanted something a little different without the alcohol. I definitely wasn't disappointed anyway as I was brought over a lovely strawberry daiquiri. It was amazing and Logan's strawberry milkshake was awesome too. He was so pleased. My yummy Crayfish & Prawn Cocktail starter. There's a new menu in place at Dine at 29 and everything sounded amazing from the menu description. I honestly was struggling with what to pick! I liked the sound of their Hot Rock steaks but since we had the kids I thought best to choose something a little less hot. I went for the Crayfish & Prawn Cocktail to start as I really love seafood. And in the end I finally decided on the Highlander Burger for my main which included a tattie scone and haggis, yummy. It came with chips, onion rings, pepper sauce and coleslaw as well. The hubby went for Haggis Bon Bon's and then Steak & Ale Pie for his main. They both looked delicious. 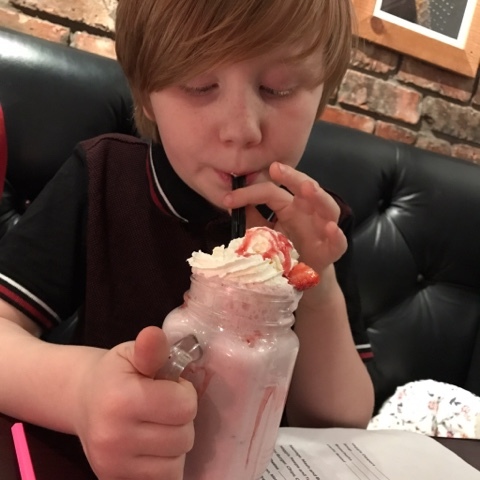 Logan tasting his strawberry milkshake, yum. 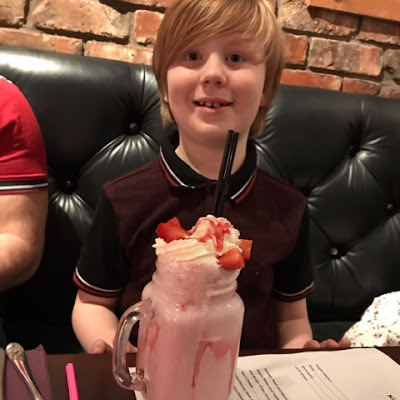 Of course the kids weren't left out and had their own special menu with a colouring in sheet on the back to keep them busy. Harlow chose the homemade lentil soup, mac & cheese and ice cream for pudding. Logan chose garlic bread, a cheese burger and ice cream to finish as well. I'd just like to say that the kids portions are well sized and perfect for Logan who's 8. 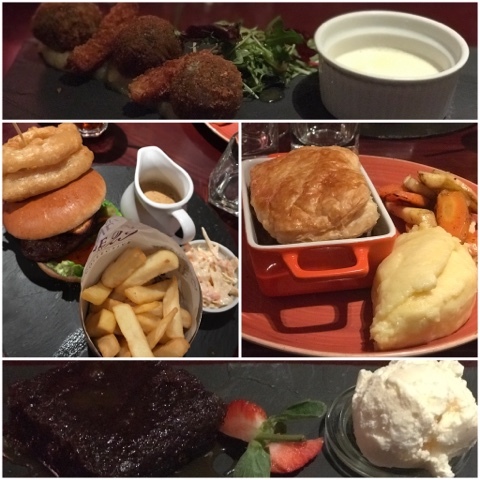 He has a big appetite and loved every tasty mouthful of his food at Dine at 29. Harlow doesn't eat much, the wee monkey, but even she gave the soup and macaroni a good go. 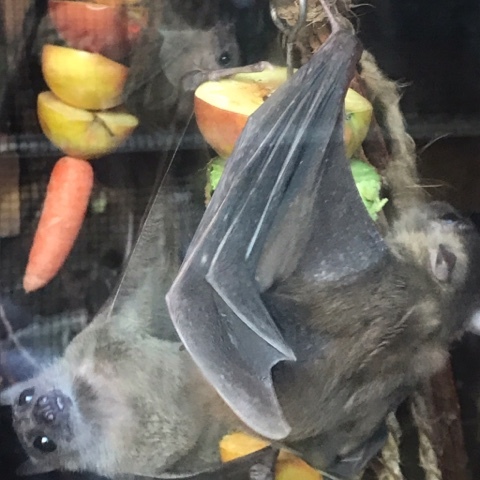 I was impressed to see her eating so well, it must have been yummy for her to eat it. Our tasty food, could go some again right now. When the food arrived for us adults we were blow away by the excellent portion size and tastiness of each dish. 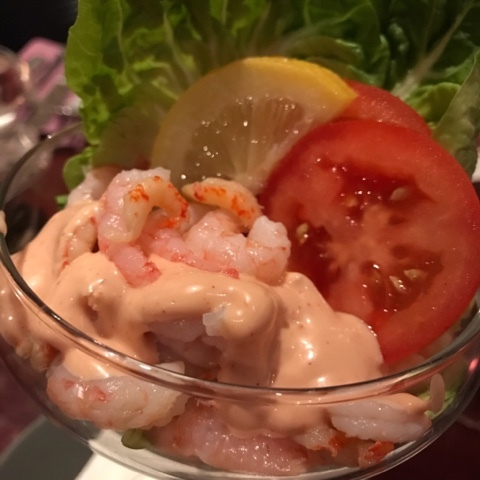 My prawn cocktail was so fresh and full of flavour. The hubby was delighted with his haggis bon bon's and we couldn't wait for the main meal. The Highlander Burger and sides was a massive dish. I really wasn't sure if I would be able to eat it all. I got through quite a bit but it defeated me in the end plus I wanted to save a tiny bit of room for a shared pudding with the hubby. The Steak & Ale Pie looked scrumptious too and I'm pleased to report the hubby managed to eat it all. Since we were so full we opted to share a pudding and went for the Sticky Toffee with ice cream. It was divine, my mouth is watering thinking about it now! 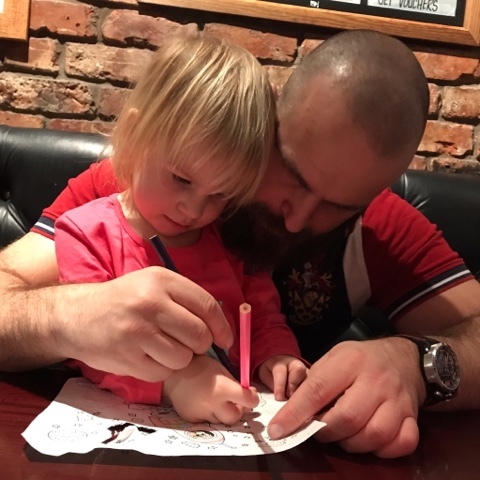 Harlow making Daddy colour with her. When we were all finished the lovely manager brought out Harlow's cake for us to sing happy birthday. He put a big sparkling fountain candle on it for her too which was really nice of him. Harlow thought this was amazing and felt super special. It brought her fabulous day to a very happy ending. 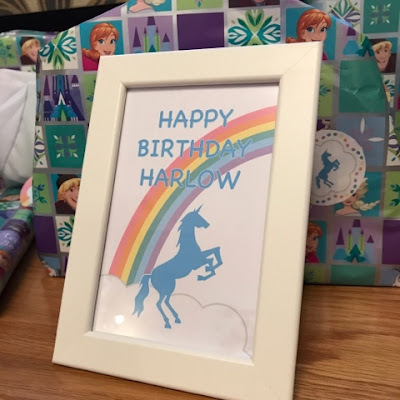 It really was a lovely way to celebrate Harlow's birthday. Good food, no rushing (or dishes) and content kids with happy full tummies. What more could you want. The kids options from the children's menu. It was a wonderful experience dining at Dine at 29 and I would definitely recommend to families, couples and friends. It's a great place to have an event, meet friends for lunch or just grab a quick coffee and chat. Prices are reasonable and the atmosphere was lovely, very relaxed and friendly. Nothing was ever too much trouble for the staff. 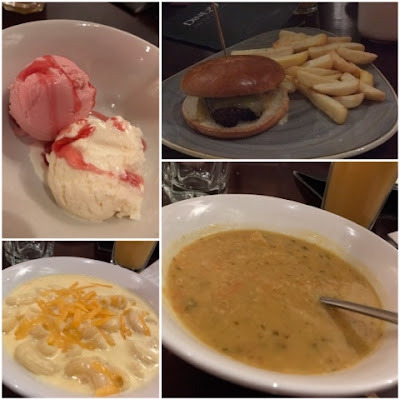 So if you're looking for somewhere nice to go in Dunfermline (or Fife for that matter) then get yourself along to Dine at 29. 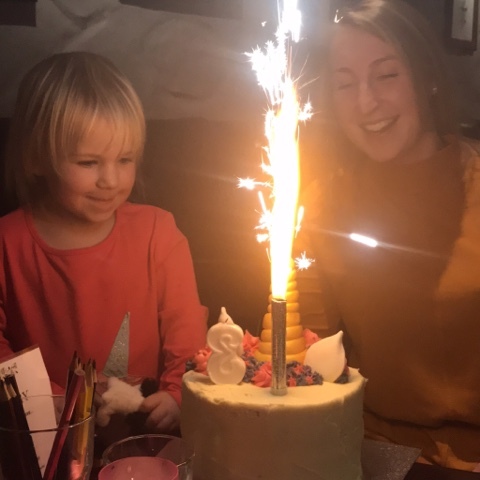 Harlow totally pleased with her cake a huge sparkler! We received a free meal in return for writing an honest review. All opinions are my own. 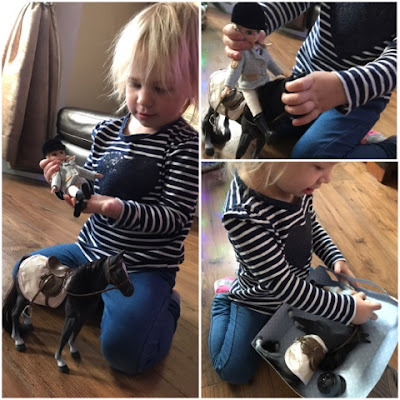 My daughter loves dolls and horses so when the really nice people from Lottie asked us to review their Pony Club Lottie Doll and Stables I couldn't refuse! Harlow has always had a fascination for horses from such a young age. I've no idea where she gets it from but horses seem to be one of her favourite animals. 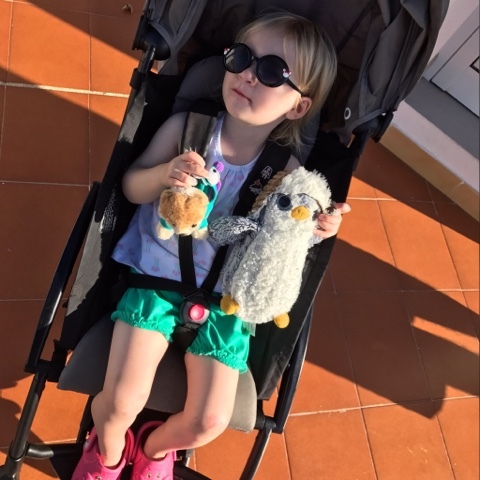 She's also a fan of dolls and is never seen without one on her travels whether it be to the supermarket or to Majorca. 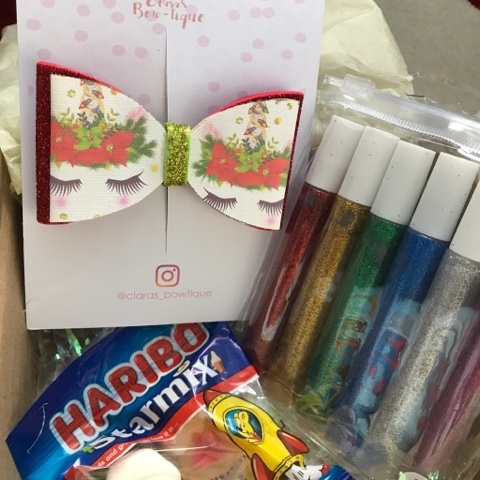 So who are Lottie? Well they're an amazing toy company who create gorgeous dolls and accessories to go with them. 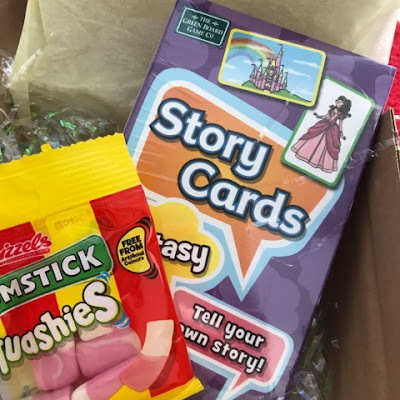 They're based in Donegal on the North West coast of Ireland and are a team passionate about preserving the magic of childhood. They've won more than 30 international toy awards to date and try to live by Lottie's rules; Be bold, be brave, be you. It's a great message to send to young people and the dolls are truly fabulous. 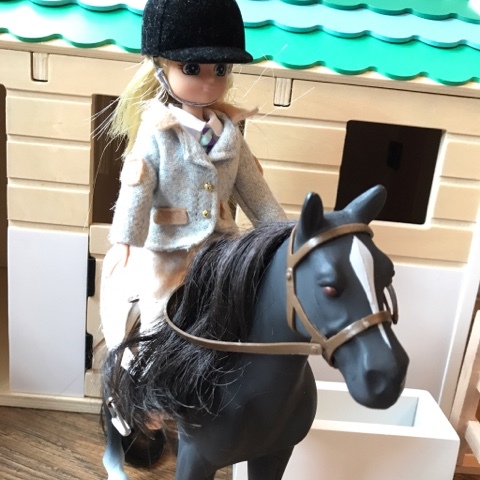 Like I said Harlow was sent the Pony Club Lottie Doll and Stables to review but I'll start with the doll. Pony Club Lottie arrived in her own little box complete with Seren the Welsh Mountain Pony. Before Harlow even opened the box she was drawn in by the beautiful care and attention taken to the box design. 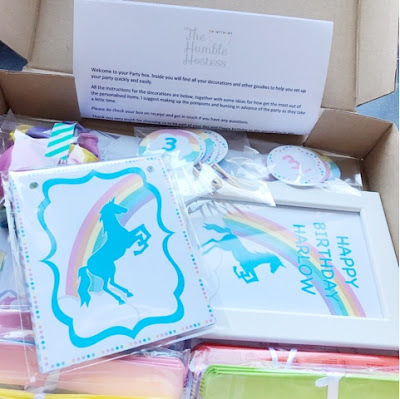 As you can see from the photos the box is colourful and designed to look like a horses stable with the words Greendale Farm Stables on the front. I love that on the back of each box the dolls come with a story. 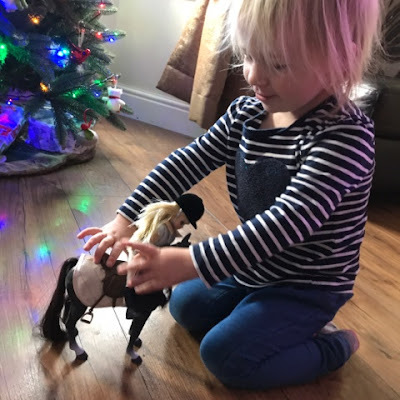 Here's the one for the Pony Club Lottie Doll: "Pony Club is about much more than just riding – Lottie learns about caring for a horse too, and studies for achievement badges covering subjects like feeding, equipment, pony behaviour and grooming. 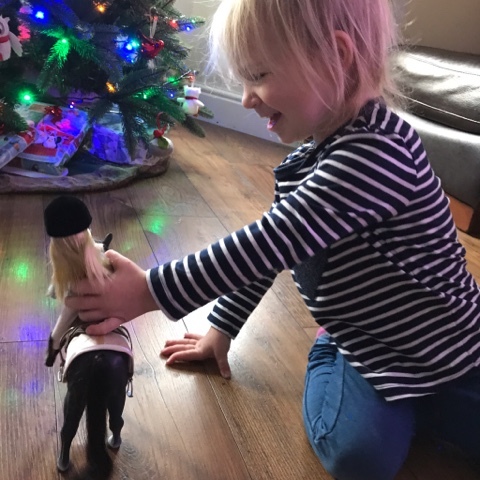 As well as trying to improve her riding, Lottie makes new friends who share her love of ponies. It’s always good fun; some days are themed with treasure hunts, treat making for ponies and lots of other pony activities." Also on the back of the box it gives you suggestions of other sets to buy which I really like. For example it says there's a Pony Flag Race Accessory Set you can purchase and I'm sure Harlow would love this. Lottie Doll herself is gorgeous with long flowing light blonde hair and blue eyes. 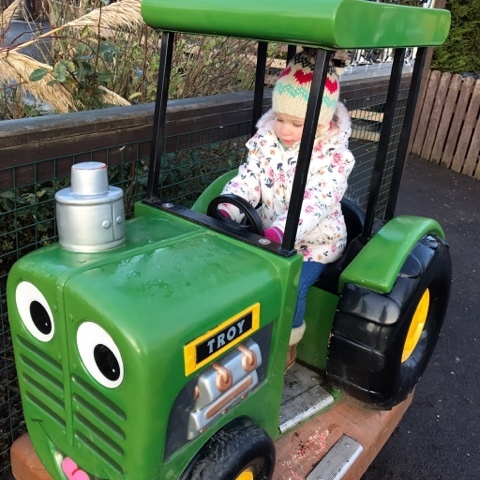 Lottie is 18cm in height and recommended for age 3 years and over. Harlow has recently celebrated her third birthday so it's perfect for her. Also included in the set is; riding jodphurs, tweed-style formal riding jacket, shirt and tie, boots, riding helmet and Seren the Welsh Mountain Pony wears a saddle, bridle, stirrups and numnah (a saddle pad that acts as a protective cushion between the pony and the saddle). The quality of Lottie and her horse Seren are fantastic. 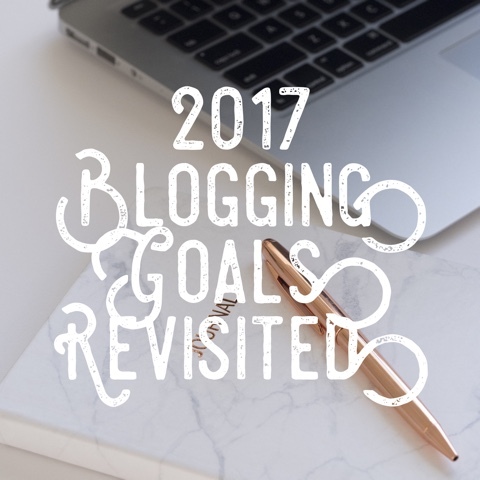 Everything from the clothes, hair and accessories are first class. Attention to detail has really been thought about and it makes the play experience more realistic. 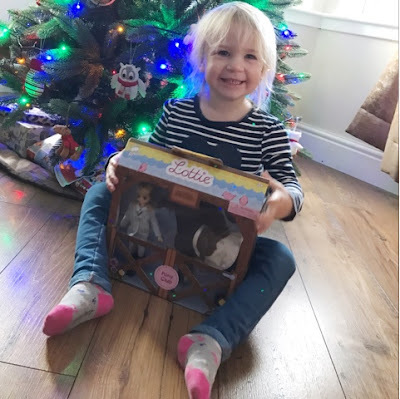 Harlow absolutely adores her Lottie Doll and Pony, in fact since she received them it's been one of her most played with toys. She gets them involved in all sorts of adventures. Harlow was also lucky enough to receive the Stables to go with her Lottie Doll and Pony. 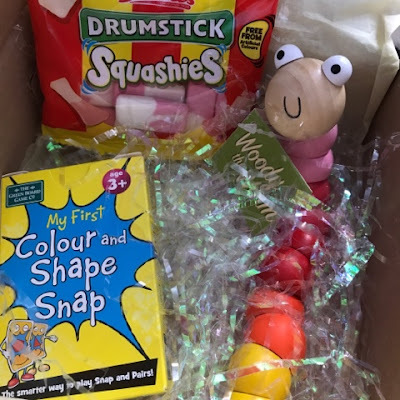 We weren't expecting to receive this to review but oh my goodness Harlow's little face was a picture when she saw it. It's honestly beautiful and totally perfect for anyone who's kids are horse mad! It requires home assembly however it only took my hubby 10-15 minutes to build. The instructions were clear and everything was provided. You just need a screw driver and you're all good to go. 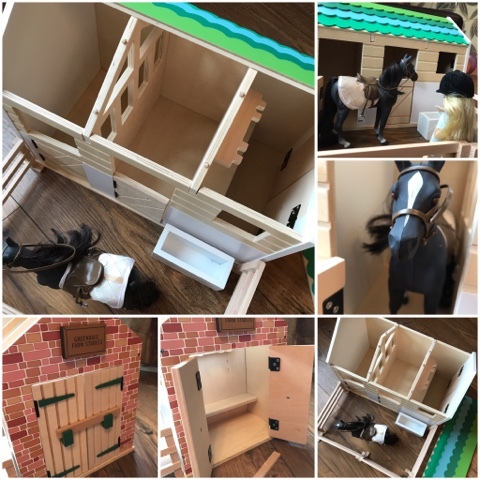 Included with the Stables are; two horse stalls with tradition style half doors, horse tack room with bench, shelf and hanging hooks, detailed doors with working wood bolt latch, removable roof in Lottie’s signature scalloped style for easy access play, brick detail walls, drinking trough and freestanding wooden fences. The set does not include any dolls, pony or accessories as these have to be purchased separately. 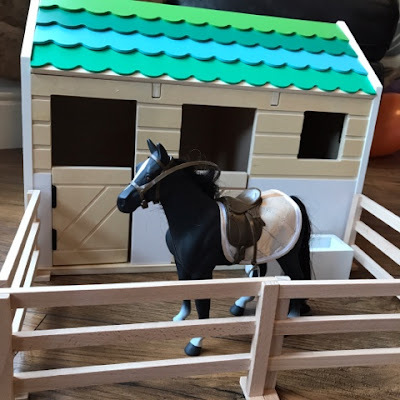 The Stables are excellent quality and made of real wood which keeps them authentic and sturdy for young hands to play with. I like that the roof is removable so it's simple and perfect for children to access with ease. When built the dimensions of the Stables are - H 330 x W 420 x D 250mm. It's a decent size but doesn't take up too much room. The Stable set is £59.99 and the Pony Club Lottie Doll is £32.99. You can buy the whole complete Stables bundle which gives you Sirius the Welsh Mountain Pony as well for £89.99. That's a saving of £21.98. I'll definitely be purchasing Sirius at some point to complete Harlow's set. Harlow 100% loves her Lottie Doll and Pony. 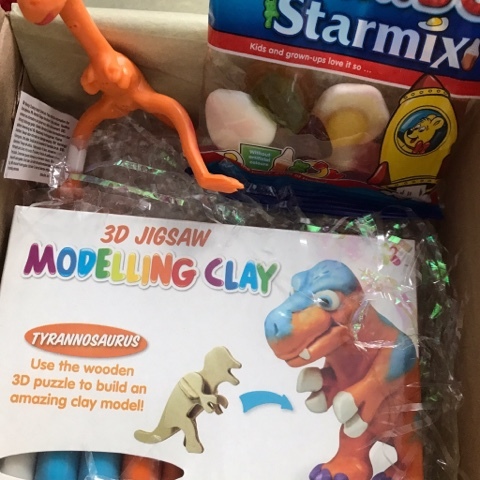 I'd highly recommend to family and friends and these sets would make excellent gifts for little boys and girls. There's so many different ones to choose from inlcuding; Forest Friend Lottie Doll, Muddy Puddles Lottie Doll and my fav Stargazer Lottie Doll. Prices start from as little as £18.99 and you'll be collecting the whole set before you know it. 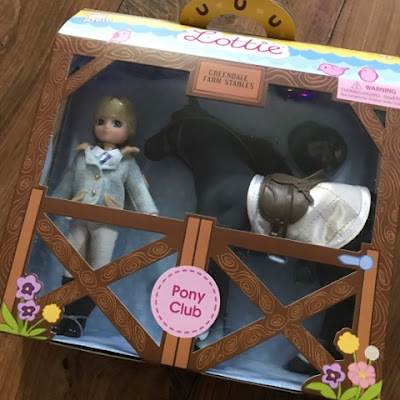 I was sent the Pony Club Lottie Doll and Stables in return for an honest review. All opinions are my own.